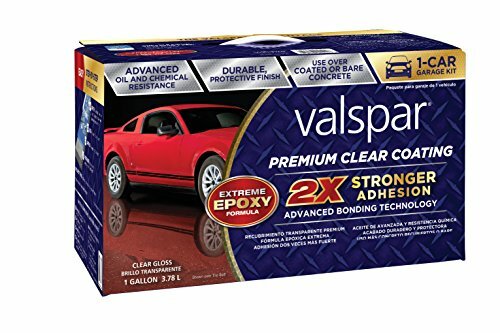 Valspar is one of those brands that you never hear about until you start researching epoxies. Let’s face it, not many of us have epoxied a garage floor before, so until now you have had no reason to know of their existence. But we know them well. What Valspar lack in brand name recognition they make up for in quality and affordability. Their products are usually significantly cheaper than some of the other big name brands on the market. But is their epoxy of a comparable quality to the big boys? Today we are going to find that out in our Valspar (81052) Premium Clear Epoxy Kit Review. This is a transparent clear coat epoxy (which is not very obvious from the image on the box). It creates a high gloss finish and is highly transparent without any clouding. This makes it great for protecting floors that are already easy on the eye. Many people use clear epoxies to create glitter floors. We can confirm that if you are looking to create a super flashy glitter floor, this is a great product. We have seen several glitter floors made with this epoxy and they look absolutely amazing. Despite the low price point, this is an incredibly durable product. Valspar state that it’s 2x tougher than concrete. It’s a super strong floor that is resilient to hot tires, scratches, scuffs, scrapes, and cracks. It also has excellent chemical resilience alongside its physical toughness. Any oil, gasoline, antifreeze, or other chemicals will not damage the flooring if you clean them up reasonably quickly. However, like most clear coat epoxies if chemicals are left on the floor for prolonged periods of time it can create a slight clouding in the area of the spill (which is really annoying, trust us). This is one of the simplest epoxies to use on the market and has been made as a single coat product. It’s a complete kit and everything you need to coat your floor is included in the box. Valspar state that this is a single car garage kit, but in reality that is a conservative estimate. Anecdotally we hear of people doing 2 car garages with a single gallon. Drying times are quick and within 72 hours you can use your garage as per normal again. In terms of durability, there is no faulting this product from Valspar. Their one coat system makes application easy, quick, and means that your entire floor can be done in a single afternoon. 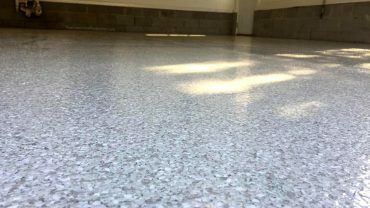 If you have just had a fresh concrete floor installed or already have a colored epoxy floor, then this could be what you are looking for. It will allow your concrete/epoxy to have a high gloss shine while staying protected from the outside world. If you just want something that is hard wearing and gets the job done at a great price point – this could be the product for you. It’s one of the most affordable epoxies on the market. But unless your floor is already immaculate (or you are covering it with glitter) then this is not the product for you. Ugly floors still look terrible when covered in glossy epoxy. On the whole, we highly commend Valspar for this great product. It is real world proof that you don’t always need to pay a premium price tag for a great product.